The Aviano Chaise Lounge features the dramatic curves that are signature of the Aviano furniture collection by Tommy Bahama. And, the curves work to the advantage of the users, as it contours the body for maximum natural comfort and the seatback adjusts for the perfect angle. The cushion supports and cradles the full body of the lounger. 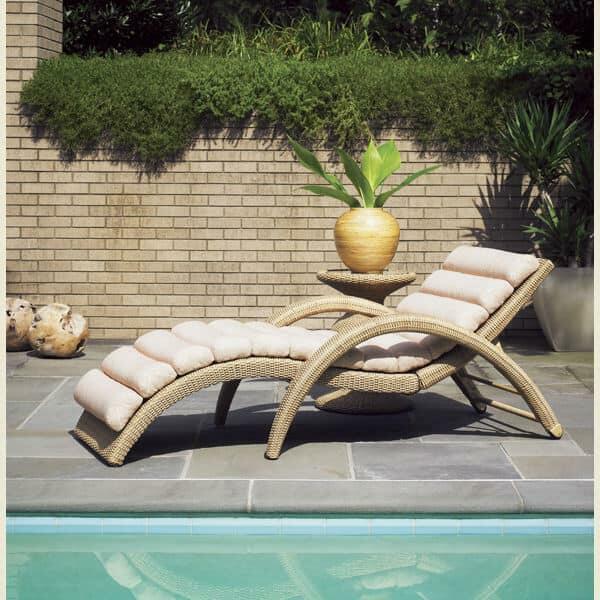 The Aviano Chaise Lounge is made with a supportive aluminum frame that is completely wrapped in a seagrass wicker. The wicker is made with the famous HDPE material, which stands up to sun, rain, salt, chlorine and more better than any wicker available. The Aviano Chaise Lounge is one member of a large family of Aviano furniture by Tommy Bahama, which includes deep seating, dining, and other collections. Mix and match the Aviano Chaise Lounge with other Tommy Bahama pieces until you have built yourself an outdoor oasis that’s just right for you and yours.